As the first week of September was nearing its end, Fighter Command, which had been constantly mauled for three weeks, reached its all-time low. Since 24 August, the two German Luftflotten in France had focused their assault almost entirely upon No. 11 Group’s airfields. Even though the daily scores of destroyed aircraft most often pointed to the RAF’s favour, there was no sense of elation. 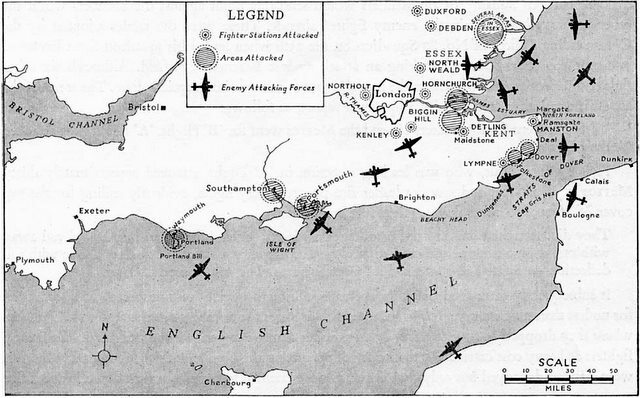 By the beginning of September, Dowding had to stop rotating his squadrons: those away from the battle scene were almost as low on pilots as those on the front line. Several squadron in the South-East pleaded with Keith Park to be posted to a quieter sector for a week or two, to no avail. Pushed against the wall, Fighter Command had no clear idea if victory was in sight, and if so, how close or far it would be. Indeed, things seemed to be turning from bad to worse. In the week ending on 6 September, Fighter Command lost 161 aircraft in air combat, for only 181 German aircraft brought down. Fortunately for the defenders, the German command also lacked a clear picture of how well their tactics really worked. Their main problem was bringing the maximum-effort campaign to a rapid conclusion. Compared with all initial calculations, the Luftwaffe was already playing in extra time, and its force was rapidly wearing out. Combat losses, particularly in the bomber units, were too heavy to sustain for very much longer. Crew morale, which was at its peak by the time of the Adlertag, was now rapidly diminishing. In addition, the Germans could not hope to replace all their lost or written-off aircraft with new machines – the monthly rate of aircraft production in Germany was nowhere near the level required to replace the losses. While the accumulated losses kept soaring to alarming proportions, many of these still fighting found themselves on a brink of emotional, and often physical, exhaustion. In Fighter Command, this phenomenon took a massive proportion. Often men sat down to eat and fell asleep before even picking up a knife and fork. Many were averaging four hours’ sleep a night for weeks. There were recorded cases when pilots dropped unconscious after a succesful landing.